Ongoing projects provide volunteers with multiple opportunities to earn the annual required 40 hours for maintaining certification. Volunteer projects approved by the Volunteer Services Committee may involve chapter service, community service, or environmental activities. So that sponsoring organizations can use the hours to obtain grants, individual times are reported to the Membership Chair monthly (in quarter-hour segments). Some of the activities listed below are really categories of activities more than specific projects. Others are specific projects (such as working on the Invaders of Texas Program) that don’t have well-defined “events”. Most of our citizen-scientist work is like this. To be covered by the state’s excess liability insurance we are supposed to have listed that particular volunteer activity. Therefore you should “register” activities whenever reasonable. The pre-approved activities that need to be registered are marked below with (register) added to their title. To register an activity please send the volunteer chair (volunteer@txmnbv.org) a short email with the following information. When the event will be (e.g., every Tuesday during June, and July from 10-11:30am). Time spent preparing for and conducting Audubon Bird Tales sessions is approved for Volunteer credit. If you are interesting in participating in this, please contact Joyce Conner (joyce@conner.net). Basic training for this program is available via an online video. Help increase number bluebirds in our area by providing new nesting boxes and then managing and monitoring the boxes during the breeding season (mid February to mid September). monitoring is available at the Texas Blue Society website http://www2.texasbluebirdsociety.org/article/Resources/. Build Bluebird nest boxes. This activity includes the acquisition of materials and the building the nest boxes. The boxes should meet the recognized requirements for bluebirds. Deploy, monitor and maintain nest boxes. Check each nest box once per week during breeding season (February to August) and record its status, fix any problems, remove any unwanted inhabitants. Talk with Jim or Kitty Anding for information on how to monitor and maintain nest boxes. Dr. Dale Kruse needs help and welcomes TMN volunteers. The Herbarium is in the same building as TCWC. Knowledge of plants is desirable, but not essential. And, you will learn a lot! If you are interested, please contact Dr. Kruse (dakruse@tamu.edu). Assist in public educational outreach programs as requested or otherwise assist the Museum. Educational presentations or activities conducted on naturalist topics with a group of children in an organized setting such as a school, daycare, after school program or summer program. Members can receive credit for time spent presenting and for work such as preparation and travel, that supports the presentation. Members should complete the online form. All projects sponsored by, recommended by, or directly approved by TPWD qualify for volunteer hours. Mr. Ed Riley, Assistant Curator of the Entomological Collection at Texas A&M University, is conducting a moth inventory of Lick Creek Park. Over 1000 species of moths are estimated to occur in the park, yet our knowledge of what occurs there is minimal. Moths will be sampled throughout the year. Moths encountered will be vouchered in the TAMU Entomological Collection and the checklist produced will be posted to the Insects and Arachnids of Lick Creek Park website. Data will also be contributed to national databases, such as the Moth Photographers Group. Setting bucket traps at LCP Friday evening at dusk and retrieving them Saturday morning. There are three trap sites off Iron Bridge and Raccoon Run Trails. All materials are stored onsite, so there is nothing heavy to carry in or out, but it does involve a bit of off-trail hiking, because the sites are far enough off the trail to prevent vandalism. The same team does not have to do both evening and morning. Sorting, field-pinning, and labelling of trapped specimens on Saturday morning. This will occur at Ed Riley’s home or that of another volunteer, over coffee. All supplies and training will be provided. Volunteers may accidentally absorb as much moth taxonomy as they wish. Ed is compiling a mailing list of volunteers to coordinate activities. If you would like to volunteer let Bruce Neville know. He will compile the names and get them to Ed. The Monarch Larva Monitoring Project (MLMP) is a citizen science project involving volunteers from across the United States and Canada in monarch research. It was developed by researchers at the University of Minnesota to collect long-term data on larval monarch populations and milkweed habitat. The overarching goal of the project is to better understand how and why monarch populations vary in time and space, with a focus on monarch distribution and abundance during the breeding season in North America. As an MLMP volunteer, your contributions will aid in conserving monarchs and their threatened migratory phenomenon, and advance our understanding of butterfly ecology in general. Register and get trained with the Monarch Larva Monitoring Project, http://www.mlmp.org/. Then your reported monitoring activities are approved for TMN volunteer credit. 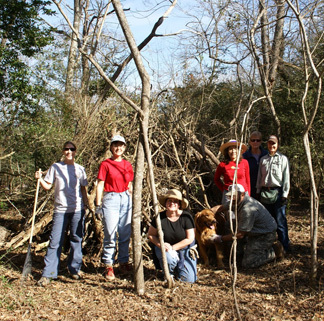 The Invaders of Texas Program supports the creation and perpetuation of a network of local citizen scientist teams who seek out and report outbreaks of selected environmentally and economically harmful invasive species. These teams, coordinated by the Wildflower Center, contribute important data to local and national resource managers who will, in turn, coordinate appropriate responses to control the spread of unwanted invaders. The Invaders Program is designed to move the target audience beyond awareness to action on invasive species. Volunteer activities include the identification and reporting of invasive species as well as proper control or elimination of reported species. Volunteer activities are eligible for volunteer hours if the volunteer has competed training, or is supervised by someone who has completed training, and the activities are carried out as specified in the training. Training can be either completed online or by attending a workshop. A workshop is being planned for June 2013 in the Brazos Valley area and will be announced when details are finalized. For general information regarding this program, visit http://www.texasinvasives.org/invaders/. For information regarding the “Brazos Valley Invaders” satellite, visit http://www.texasinvasives.org/invaders/satellite_detail.php?satellite_id=64. More info is available at http://feederwatch.org/about/project-overview/. Project FeederWatch is a winter-long survey of birds that visit feeders at backyards, nature centers, community areas, and other locales in North America. FeederWatchers periodically count the birds they see at their feeders from November through early April and send their counts to Project FeederWatch. FeederWatch data help scientists track broadscale movements of winter bird populations and long-term trends in bird distribution and abundance. Anyone interested in birds can participate. FeederWatch is conducted by people of all skill levels and backgrounds, including children, families, individuals, classrooms, retired persons, youth groups, nature centers, and bird clubs. Participants watch their feeders as much or as little as they want over two consecutive days as often as every week (less often is fine). They count birds that appear in their count site because of something that they provided (plantings, food, or water). New participants are sent a Research Kit with complete instructions for participating. You provide the feeder(s) and seed. In addition, U.S. participants receive a subscription to the Lab of Ornithology’s newsletter, Living Bird News. Canadian participants, receive Bird Studies Canada’s quarterly publication, BirdWatch Canada. There is a $18 annual participation fee for U.S. residents ($12 for Cornell Lab members). Canadians can participate by joining Bird Studies Canada for CAN$35. The participation fee covers materials, staff support, web design, data analysis, and a year-end report (Winter Bird Highlights). Project FeederWatch is supported almost entirely by participation fees. Without the support of our participants, this project wouldn’t be possible. Project FeederWatch is operated by the Cornell Lab of Ornithology and Bird Studies Canada. Collecting and reporting data for iNaturalist is approved for volunteer credit. This includes organizational projects such as the development of a iNaturalist guide to a Texas area. Time spent in a dedicated collecting activity can be counted, but if the observation is incidental to another activity it should not be counted. Travel time can be counted according to our standard guidelines. Only observations that are reported can be counted for volunteer hours. Reporting time is counted as actual time spent reporting. Time spent reporting eBird data is approved for volunteer credit, however time spent collecting e-bird data is not approved unless it is part of an organized bird survey that is separately approved for volunteer credit. More than ever, people are interested in watching and learning about Texas wildlife. Texas Parks and Wildlife Department, along with other partners, offers Texans the opportunity to do just that while making valuable contributions to the conservation of animal and plant species in the state. Texas Nature Trackers, associated with the Texas Master Naturalist Program, is a citizen-science monitoring effort designed to involve volunteers of all ages and interest levels in gathering scientific data on species of concern in Texas. Through Texas Nature Trackers projects, you can learn how to gather data about various species found on public lands or on your own property. Collected data is sent to biologists who use the information to gain a better understanding of the status and management needs of various species. The goal of the program is to enable long-term conservation of these species and appreciation among Texas citizens. Activies under all of these citizen scientist projects are approved for volunteer credit. Further information on the current Nature Trackers’ program is available through the links below. Collect water samples to measure contamination in local watersheds. This is an updated and revised version of the project known as Stream Team that was monitoring the Carter Creek watershed and is winding down. The new version is much less structured. Volunteers may sample on a much more flexible and convenient schedule. Also, a wider range of sampling locations is now available. The Institute will provide training and sampling kits. Maintain the native Texas plants in the garden and assist as requested (e.g., in cataloging and maintaining the collection). Chapter management work such as attending board meetings, or any work done to support one of our committees. Mentoring new trainees by attending the current trainee welcome and graduation ceremonies. Attending the first chapter meeting of the year when certificates are awarded and committees are organized. Outreach activities that are approved by the Outreach Committee. These include activities like manning a BVTMN booth at some event (Earth Day, First Friday, BioBlitz, Boonville Day, etc. ), preparing outreach materials, or giving a presentation about Texas Master Naturalists. Planning for, preparing for, and conducting a Junior Naturalist program. Or, support for Junior Naturalist activities. Public educational presentations on TV, radio, or group settings that members give on the Texas Master Naturalist Program, or on the following naturalist topics: Texas native plants; water conservation and fresh water management in Texas; Texas invasive plants; Texas wildlife; Texas wildlife habitat management; and endangered or threatened species in Texas. Members would receive credit for time actually presenting and for work such as preparation and travel, that supports the presentation.